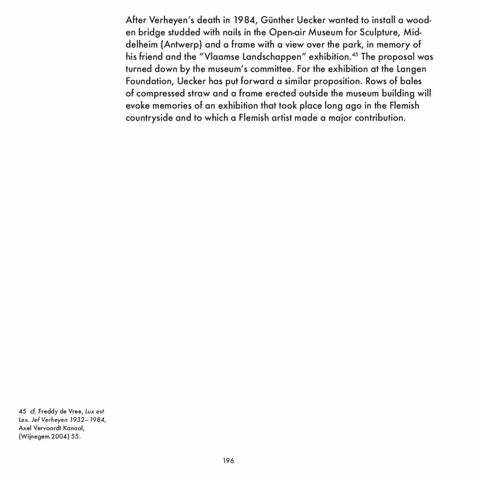 After Verheyen’s death in 1984, Günther Uecker wanted to install a wooden bridge studded with nails in the Open-air Museum for Sculpture, Middelheim (Antwerp) and a frame with a view over the park, in memory of his friend and the “Vlaamse Landschappen” exhibition.45 The proposal was turned down by the museum’s committee. 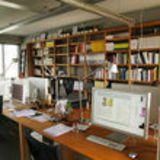 For the exhibition at the Langen Foundation, Uecker has put forward a similar proposition. Rows of bales of compressed straw and a frame erected outside the museum building will evoke memories of an exhibition that took place long ago in the Flemish countryside and to which a Flemish artist made a major contribution. 45 cf. Freddy de Vree, Lux est Lex. Jef Verheyen 1932 – 1984, Axel Vervoordt Kanaal, (Wijnegem 2004) 55.